Thinking back over my police career makes me feel old. Really. I first took up the badge and gun in 1977; that’s thirty-four years ago. I have been retired for almost seven years now. When I write about that part of my life, I am writing about history. (I was part of police operations protecting President Reagan and Vice-President Bush.) I was part of a murder investigation that was so long ago, the killer is certainly on parole by now. In police parlance, that really makes me an old hairbag. Oh well. I only mention all of this because I have been planning to tell you this story that dates from sometime in the mid-eighties. Since I have been living with this story for about twenty-five years, and it’s a pretty good story, you can well imagine that I will be following the story with some commentary. Oh well. The boro of Teterboro is the sort of town that couldn’t possibly exist anyplace but New Jersey. There is no reason or excuse for Teterboro. The population of Teterboro was twenty-two at the time in question. But do not make the mistake of thinking, therefore, that this is some tiny, sleepy settlement, isolated in the mountains. No, Teterboro encompasses about two square miles in a very densely populated, almost urban part of the state, just a few minutes from the George Washington Bridge. Interstate-80, all ten lanes of it, goes through Teterboro, and US-46 bisects the boro. (By the way, that’s really how we spell “borough” in New Jersey.) About half of Teterboro is industry and warehousing. 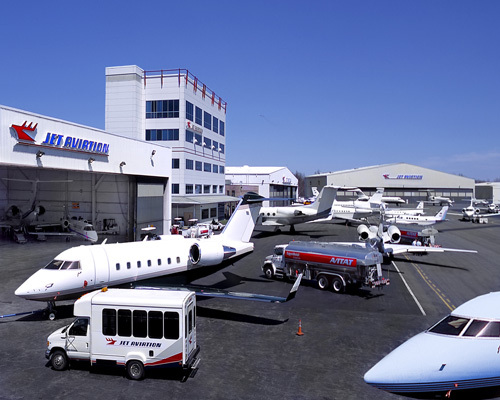 The other half is Teterboro Airport, the busiest general aviation airport in the United States. A handful of houses in a line along Huyler Street, on the South Hackensack border, account for the resident population. The Teterboro Police Department hasn’t existed for years now, but, at the time in question, it consisted of five officers, one of whom was usually on duty. They relied on us, the county police, for back-up, assistance, and coverage. Of course, I got there first, but there were five of us, including a plainclothes sergeant, in no time, and more cops coming. We were frantically trying to find anyone who could tell us anything, when the airport manager came careening across the tarmac in a yellow station wagon with an amber beacon on the roof. He shouted through his open window that the plane was on the ground and taxiing. Just then, a twin-engine plane, big enough to hold about a dozen passengers, came around a row of parked planes and turned toward where we were. It slowed, then stopped, just short of us, its propellers spinning. A minute passed with no movement save the turning propellers. We jumped into our cars; another cop named Steve piled in with me. We chased the plane up the taxiway along the west side of the airport. The sergeant’s voice came over the radio: “Don’t let him onto the runway!” The plane left the taxiway to cut through an aircraft parking area. Two police cars raced up the taxiway, cut into the parking area in front of the plane, and blocked it. The plane stopped, surrounded by police cars. I was to the right of the plane, even with the tail. We all jumped out and found what cover we could. I was crouched behind my car, holding my .357 revolver level in both hands. There was no door on the side of the plane facing me — it was on the left side, behind the wing. If someone opened that door and began firing a machine gun out of it, the cops to the left of the plane would be little better than defenseless, half-exposed, armed with six-shooters. I knew that if automatic weapon fire erupted from the plane, cops were likely to be killed; the only chance they would stand would be if those of us out of the line of fire on the right side of the plane peppered the fuselage with gunfire. We were ready. The engines shut down and the propellers stopped spinning. I knew that the door had opened, because the sergeant was shouting orders at the plane. Three men came out of the plane with their hands raised, moved away from the plane, and lay on the pavement, face down. Three young women, then two men dressed as pilots followed and joined them. We advanced. Someone checked the plane’s cabin, and found no one waiting in ambush. The sergeant assigned me and someone else to search and handcuff the suspects. One of the men I searched had drugs concealed in a film canister in his sock. One of the other men had a .380 pistol. It was decided that we would take everyone to headquarters, where we could better sort the guilty from the innocent, charge the guilty, and get statements from the innocent. I put the drug-carrier in the back seat of my car, hands securely cuffed behind his back, and Steve, the cop who had ridden onto the air field with me, got in front again. We started back to where we had left Steve’s car. The object that he held out to us looked like a pen. On closer examination, it proved to be something that Steve and I had heard of, but never seen before; a pen gun, a single shot .38 calibre weapon disguised as a pen. It had been in the man’s sock, next to the much thicker canister of drugs. I had felt the fat canister, but not the much thinner object next to it. That could have been the worst and last mistake I ever made. I later learned that the three men (not counting the pilot and copilot, who were simply flying a charter) were members of the Pagans motorcycle gang. The Pagans, who I had dealt with before, had evolved from the sort of things one thinks of when one thinks of motorcycle gangs, into a full-service organized crime syndicate, involved in drug dealing, stolen property, protection rackets, and all the rest. One was a gang boss, and the other two were underlings who acted as bodyguards — hence the submachine gun. The young women said they had met the men earlier that day in a bar, and had accepted an invitation to go with them to a Giants football game, traveling by chartered airplane. (Giants Stadium is about two miles from Teterboro Airport.) When the plane taxied up to the terminal, and the gangsters saw all the cops, they conferred, then ordered the pilots to take-off again. The pilots had seen the weaponry come aboard, so, putting two and two together, they were scared, and put out the mayday signal. The three men were charged with multiple crimes, including kidnapping the pilots, but as I heard it, none of them lived long enough to go before a judge. I heard that the gang boss fell out of a boat in the middle of a lake on a calm day. Quite a story? I can see this story as part of a movie or a TV episode; maybe draw out the chase scene a bit, make it faster, with police cars and airplane careening around the airport, rocking side to side as they weave in and out, tires screaming, sirens wailing …. Wait a minute, it’s a good story, but it isn’t Something Entirely Different — I just proved that by turning it into a Hollywood blockbuster — it’s something entirely the same. It became something entirely different for me by living with it a while. As it turns out, missing a gun when I searched a subject wasn’t the worst mistake I made, I had already made a worse mistake, a few minutes earlier. And so, for me, this becomes a story about guilt and forgiveness, and a meta-story about story-telling and how potent stories are in the world. But this is already a very long post, and so, I will publish what I have written so far, and let you live with it for a few days, and I will keep writing. Look for Deadly Force II, coming soon to a theater near you! This entry was posted in Personal, Police and tagged blogging, crime, police, writing. Bookmark the permalink.